This is the most recent default database for WMMA4, combined and tweaked with CVE, O+, Eyeball Pack, Weidtverse, CFS, & many others. All duplicate renders are removed and all fighters have unique renders. Many late fighters have there debut time moved earlier to be anywhere between 2001 to 2010. I advise that you use this mod as a base mod. You should be extremely strict when importing into this mod as I've most likely added it within reason. -Unique Character Count is at 2912! The next 100 unique characters will debut after 2001 in areas where there just isn't much action yet in places like Africa & Australia. Let's hit 3000 before WMMA5! Thanks for sharing this! My only gripe seems to be that you've added elite tier (95+ stats which should be superrare) women that already debut before the start of the game. Why? They will just own the existing official C-verse stars. Their profiles look like they've been generated by the game itself, which seems hardly fitting for an elite fighter (I tolerate them for cans). That was also my only gripe against Asaemon's changes in the original CVE: He added a couple of elite men who just beat up the cream of the C-verse crop (at least in my games). It seems... unnecessary. I took great cares not to edit the default setup and had them debut at the start, but with reduced stats. That being said: many will enjoy it as it's a fresh take. I'm not criticising, just voicing my dislike for it. But I can always just move them back myself. Seems like you added a custom name here and there... Frickin' 70K names? Really? I'd also advise to change or even delete the narratives for WEFF. They are scheduled to change to 5x5 main events (non-title), but have a default 7x3 title fights, which seems a little off. Good god it takes long to sim a year. I like the idea of WEFF having the child companies. They produce about 3 events a year which seems realistic. - The database also seems to suffer from the earlier "attribute bloat" issue. Sarah Vaughan, for instance, has a background in judo and muay thai. - There's a woman named Manolita that has a background in boxing but the profile says judo, and she doesn't have a profile. She's ranked nr 11 P4P but comes in at 0-0. Last edited by Blackman : 01-18-2016 at 06:00 PM. Thank you for replying, if you make any changes to the database upload it for me and I'll make it the new version. I didn't change the stats around too much personally but I try to give fighters strengths and weaknesses. Then I would test them in the fight picker. For everything else I wanted fighters to train with there teams but I'll make sure that current C-Verse champions have a good running. As for attribute bloat I didn't know that was a thing, my loading times are OK. What I will admit is that I carefully imported CVE characters so that is probably why your seeing similar changes as in Asaemon's version. Yeah I added custom names here and there, the 70,000K names are necessary if you truly want to see real names in local fights based in that area. Yeah the Narratives aren't fully fleshed out just yet. I'm glad you looked at some of the ones I added. I'll adjust the WEFF Narrative if you decide not to up any changes of the DB. WEFF having the 3 child companies is quite awesome I agree, I'm glad to see many of the females you added tally up there match numbers. I was thinking I should limit there popularity level but so far I haven't played over 4 years to see too much of a climb. I'll fix any attribute errors you find, feel free to add profiles and send them to me. There a quite a few people that still do not have any profile info at all. I updated the DB again, I'll be making periodic changes and minor updates like this without warning (or notes) a lot on my free time. None of my minor changes are really worth starting a new game over. I want this to be a base mod that people can change how they want. I replaced the WEFF 1 - 3 narratives with 4 new ones, updated the flavor text and headlines. I made all 3 of WEFF's child organizations different from each other in rule set with appropriate bio. This should allow the 3 smaller companies to stand on there own and have there own appeal. I decided to split AWFC into 3 weight Classes instead of a singular roster. LVFF is based on Las Vegas show entertainment and like wise set to saturate with a singular maxed out roster. Let me know what you think of the changes. Made adjustments for starting wealth for companies with no roster. A few characters had there name value adjusted. Last edited by Computica : 01-20-2016 at 06:39 AM. good stuff with this mod. keep up with the updates! Very interesting. I was starting to do the same thing, but now I don't have to! Edit - Nevermind, I just noticed your note about it in your to do list. Sorry about that. The default free pictures for women have all been assigned by the mod, so it's pointless to add them. If you all decide to add a picture from a pack in the forum I extremely advise you check the body & face folders for duplicates using VisiPics. I haven't posted a another update yet because I've been busy making new renders for unique males. Some of the male renders are down right horrible quality so let me know which characters could use a face lift. Only 2 - 4 twins Actually share a render with another twin, I forget the names, but I'll make them brand new renders when I get the chance. I'm also open to any suggestions you all may have. I had to separate them until I sorted out the duplicates that should of been alternates and agers for unique fighters. I'll release an update/add-on to the pictures when I'm done sorting them out. Edit 2 - I just wanted to let you all know 'm still in the process of making/sorting my render Library in Daz3D Studio. 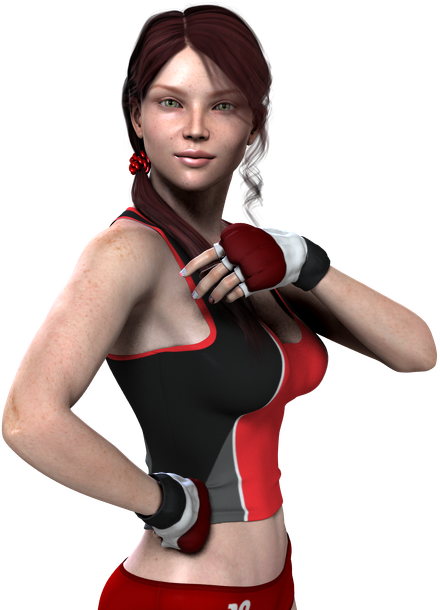 I plan to make at least 4 new renders for fighters a week. Last edited by Computica : 02-02-2016 at 12:36 AM. I've noticed a large number of regens coming up with no images for their character, any chance you can remove all the characters with no pictures in the next update to this mod? Hopefully that should fix the amount of no picture regens. By "regens" do you mean the 'new' characters who are randomly generated during game play or the characters who are re-generated from characters with pictures from the start of the game after they died off? In my current work database there are 37 (male) active fighters with no images which will get assigned pictures and 15 others that will eventually get images. Are you talking about the Free Pictures that don't have a picture assigned to them yet? I've seen at least one fighter who had a write up but no picture, not sure if you've missed out on assigning him one, can't remember his name but if you need it and I run across it again, I'll keep an eye out. I know he's signed to Sigma. That's already on my to do list on the OP. There's over a hundred free female renders I need to sort out for duplicates, and 155 more unused renders that aren't even assigned to anything. They'll be added on as an update for the Picture DB later so your current game will utilize them. Any idea on when the next update will be? Calantha Maillet is a Canadian athlete who entered C-Girl in 1994. She is one of several females known to have studied more advanced forms of Judo before MMA became quite popular. Before the start of her MMA career she practiced strictly with males since at the time there wasn't any major female promotion at the time. Known as one of the original C-GIRL fighters, she climbed the ranks until there closing in 1997. Even though she is quite the fighter in a ring match, she has yet to compete seriously in a cage. Last edited by Computica : 03-28-2016 at 06:52 AM.